By improving its TV service and adding new features like Netflix and TalkTalk TV store, TalkTalk has carved a niche for itself as a major pay TV provider in the UK. TalkTalk offers some of the low cost TV deals with options to add Sky Cinema and Sky Sports channels. BT Sports will soon be available with TalkTalk TV packages, making them perfect for everyone in the home. The catch up service is available so you can watch TV shows that were broadcasted in the last 7 days. Other than TV shows, there are thousands of on demand movies and videos that you can rent or purchase from its Store. You cannot get TalkTalk TV without subscribing to its triple play service which offers broadband, calls and TV as a combined product. To help you cut the cost and choose the channels you need, the packages include Freeview channels only while a number of boosts such as Kids, Sky Sports, Star TV and Entertainment Extra are available to add with an extra, contract free subscription. Here, in this review, you would find all the information you need to know about TalkTalk TV, its good features and limitations, packages, TV boosts, TV channels list, prices and the latest offers. Technically speaking, TalkTalk TV uses YouView set top boxes which come with built-in aerial socket to access freeview channels via terrestrial broadcasting. It allows you to watch up to 80 Freeview channels including 12 HD channels like BBC News, ITV, Channel 4 and CBBC. With HD enabled YouView box, you can watch freeview, pay, premium and OTT channels and also access to popular online video players such as ITV and BBC iPlayer. The variant, YouView+ box comes with a video recorder and storage to back up 200 hours of live TV content. Both the boxes which are worth around £200, are included for free with TV packages. By connecting YouView box to TV set, you can watch the shows on big screen or with the help of TalkTalk Go app, you can watch the live TV and videos on your smartphones, Apple iPhones or tablets via WiFi. TalkTalk TV is also internet based, IPTV service means it allows users to watch online videos via broadband connection which can be wired or through wireless router..
With the help of electronic TV guide, customers can watch on demand videos via BBC iPlayer, Demand 5, ITV player & All 4, and catch up TV from popular channels. 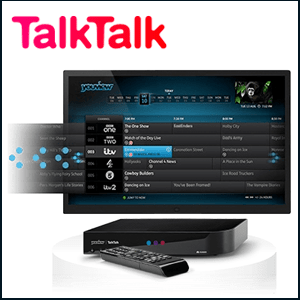 There are two packages for the new and existing TalkTalk broadband customers – TV and Plus TV. This cheap triple-play package includes YouView box which can pause and rewind for up to 30 minutes and offers you 30 days catch up of TV shows. Along side the 80 Freeview channels plus 15 HD channels, you can get more channels by subscribing to TV boosts like Entertainment, Kids, Sky Sports and Sky Cinema. You can download the latest movies, stream them or watch them on the go using TalkTalk Go app. Now you can rent and buy the latest movies from TalkTalk TV store. Totally unlimited broadband and free calls to Talktalk landline numbers are included. TV Plus customers get the second generation YouView+ box which can record up to 185 hours of live TV shows along with pause & rewind functionality. The TV pack includes 80+ freeview channels (15 in HD) plus TV Select which allows you to watch like Sky channels including Sky 1, Sky 2, Living, Sky Arts and Sky Sports News HQ. You can also add extra channels using TV boosts or rent or buy your favourite films from store. You can now stream hundreds of movies and TV shows on TV or on the go. You can choose Faster Fibre (35Mbps average speed) broadband or Fibre Large Plus (63Mbps average speed), with TV pack. You get all the other features of basic TV pack with enhanced online protection – F-Secure Supersafe internet security. If you want faster broadband , you can choose Faster Fibre (35Mbps) or Fibre Large Plus (63Mbps) broadband with Plus TV. TalkTalk TV boosts are packs of channels under different categories such as Kids, Movies, Sports, Music and Entertainment. Available to Essentials and Plus TV for extra cost, they range from £5 to £40 a month. You can add or cancel them at any time, however, minimum one month subscription is required. Boosts will be automatically rolled over to next month till the end of contract, unless you cancel them. Once you have bought a specific boost, you can access the channels in that boost via on demand player and TV guide. If you need just TV, you are better off with Sky or Virgin Media, because they offer more channels and better features. TalkTalk offers good value for money as a triple-play service not as a standalone pay TV provider. YouView set top box which is offered with Essentials package can not rewind live TV shows for more than 30 minutes. Neither it has storage to record TV shows. Although Essentials and Plus TV sound very cheap at the first glance, you will soon find out that they do not come with popular channels for which you will need to take up boosts, making the packages expensive.